Happy Hallowe'en! Recognized, and Good News for Tina! Happy Hallowe'en! We're staying in tonight and watching scary movies (double bill of "Evil Dead" and "Evil Dead 2" - woo! ), but I took advantage of my workplace's invitation to come to work in costume to be a little more outrageous on a Casual Friday than I normally would. This definitely called for killer boots! Oh, yeah! The black thing that I'm wearing is a dress from the 60s. It is double-knit polyester (WARM), and is slit up to the waist at the front, creating a long panel. I can just picture it with hot pants and go-go boots (and I've worn it with just funky tights, very Lady Gaga, but then, I was a lot younger when I wore it like that). For me now, I'll stick with skinny jeans! 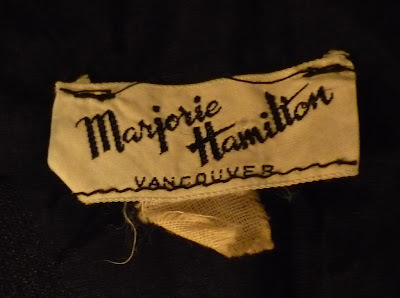 The dress still has its vintage label. I added my Shi Studios choker and my punk cuff (I was going to do some fake tattoos, but as you can see by the Dolphins clock, it was already 8:08ish in the morning when I took this pictures). Of course, Hallowe'en is the perfect time to break out the cape! This is a super-long cape made out of stretch velvet. I've had it for years. Yes, that's a castle in the background. 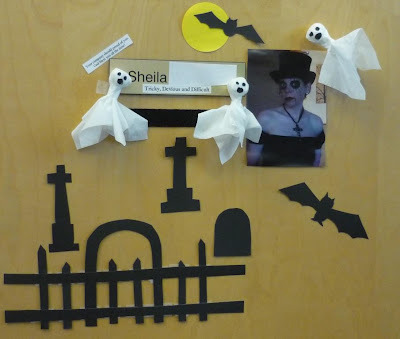 For fun, this is my office door, which I decorated. I cut up a black file folder to make the fence, the gravestones and the bats. The ghosts are made out of Kleenex and the yellow moon is a sticky-note. The picture of me is from when L and I went to see Alice Cooper. The notes on my name plate say, "Tricky, devious and difficult" and "Your company should proud of you [sic]! God bless you all the time!" Two conflicting opinions of me from different people I had dealings with, heh heh. A shout out to Jennifer, who reads my blog (found me through Kasmira) - she caught me out shopping in my favourite thrift store and recognized me, despite the fact that I had not washed my hair, had no makeup on and was sweaty. Thanks for reading, Jennifer! And finally, Tina! The orange skirt was there! I bought it - and sent you an email. Send me your address and I'll ship it to you. Dress (Marjorie Hamilton Vancouver, vintage 60s), jeans (Esprit), boots (Aldo), choker (Shi Studios), cuff (old). And nothing exciting happens! I thought about doing a retrospective like Kasmira, but eh, I'm tired and it's been a long day. I'm all matchy! My lovely sparkly bubble skirt with the pockets, and my super-hero tights. This skirt has no slit - I can't take big strides. Most annoying. Isn't that lovely? 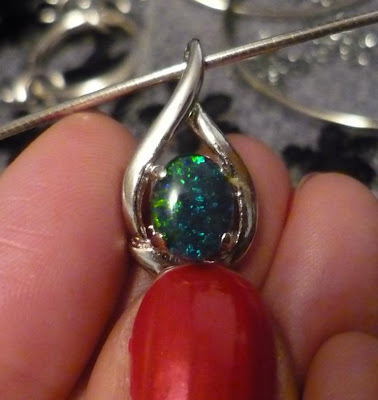 The stone is an opal triplet, meaning it's a thin slice of opal set on a black background, with clear quartz on top of it...sort of an opal sandwich (it also means the opal is cheaper to buy). This particular slice of opal is a Lightning Ridge Black Opal (named after the town in central western New South Wales). They have a black "potch" on the back, which gives them lots of colour and sparkle. Sweater (some brand from Hong Kong, consignment), cami (only hem showing, InWear), skirt (Kenzie Girl), shoes (Franco Sarto, consignment), cuff (gift from Mom), opal pendant (gift from Mom), white gold hoops (gift from L). New Shoes! Another Confession! Push-ups Work! This is a very busy entry. Ah, such is life. I've been mulling over what to wear with my new shoes. I went with yellow. My favourite mustard cardi - soon to be set aside for warmer sweaters - and my black polka dot skirt (the dots are really small). 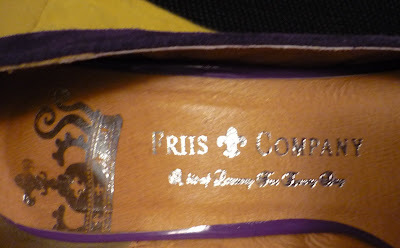 The shoes are by Friis Company, from Denmark. They're purple! They're suede! The shape is very 50s-looking to me, and the peep-toe is nice and small. They were were also very comfortable and did not rub a bit all day. It is worth it to spend money on good quality shoes. 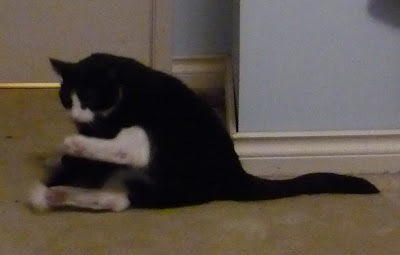 Inigo doesn't care about shoes unless he is digging in them. That is what a fat cat looks like when he's trying to get up. Ah! They are so lovely and the suede is so soft. It says "A bit of Luxury for Every Day". You have to read their blurb - "the triviality of everyday" is such a great phrase. I made the necklace years ago out of beads that were given to me by my mom - I think they belonged to my great-grandmother? Not sure. Mom, email me and tell me. 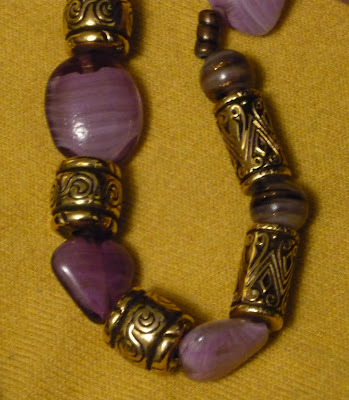 The purple glass beads are the old ones - there is one oval one and the rest are triangles. I should remake this - the little bronze beads are tarnishing. Okay, the confession. Just like with the birthday money that I got, I had to top up the gift certificate amount by $15.00 (the shoes were $165.00). I feel it was justified. And I'm still not off the wagon...I will still adhere to my goal. And finally, the push-ups that I started doing last week - I did keep on doing them. I probably do about 60 push-ups a day, minimum. It's so much easier doing 10 easy ones at a time! Look out, Sarah Connor! Still looking a little flabby underneath but I do have loose skin from losing weight, so I'm probably stuck with my "buh-byes," ha! 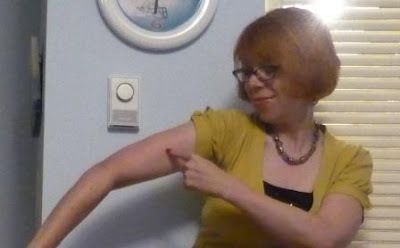 I'm pointing at a muscle that I can see (only me?). I was stiff the next day after my initial day of push-ups, especially across my chest and in my triceps. 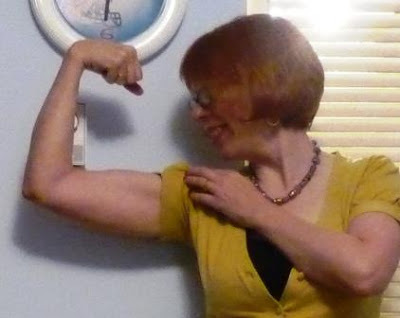 Ruth suggested I do some triceps dips (using the arms of my office chair), which helped get past that stiffness. I definitely feel that my back and shoulders are stronger - and it's making me stand up straighter. 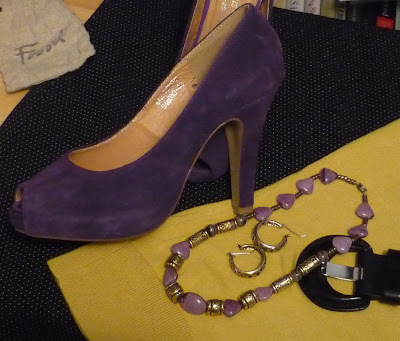 Cardigan (Jacob), cami (Esprit), skirt (Precis Petites), shoes (Friis Company), belt (Plum), necklace (mix of vintage and new), earrings (don't remember). I think the conservative cut of the suit anchors all the funky stuff and keeps it office-appropriate. If I'd had a big meeting or something, I could easily have stripped off some of the bigass items and looked very buttoned-down. Dude...let's not get all stressed. Peach cami (I tell ya, that 80s peach is going to come back! ), brown shirt, plaid vest and the jacket (and the jacket and vest are both lined). There's the bigass bracelet, which is actually a necklace that I wrapped around my wrist a bunch of times. The bigass flower, of course (inspired by Kari's purchase while in my city!). The stuff: And the last bigass item is...the shoes! Woot, I love these babies! 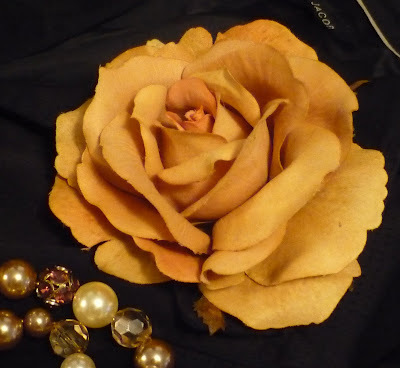 Isn't this a gorgeous flower? So pretty - the colour is not quite as peachy as it looks. It has a lot of pink and rose in the centre. Suit (Jacob, consignment), vest (Vero Moda), blouse (Esprit), cami (Esprit), shoes (Qupid), necklace worn as bracelet and earrings (Aldo Accessories), flower (Roberta's Hats). As part of my day with my 10-year-old niece, Zoe, on Saturday, we went and got manicures. I'm feeling the old compulsion to match everything to my nails, which are a bright red. I couldn't resist red - since my nails are always short it doesn't look too "dragon lady". And I have never worn this belt, despite having it in my wardrobe for over 2 years! It was $4 in an odds & ends bin in a little boutique downtown. Kitten heels for a change. My lovely Fossil jewelry from L.
Cardigan (Express, thrifted), top (I.N. 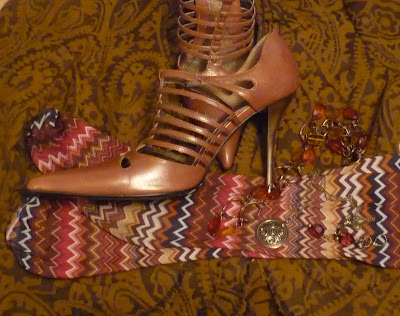 San Francisco, consignment), skirt (Odd Molly, consignment), belt (no brand), shoes (Predictions, consignment), jewelry (Fossil). Ah, Friday. Can't beat it. It was blustery and rainy all day, and I had a haircut after work. Knowing I'd have to walk home (20 minutes, mostly uphill), I planned accordingly. Yeah...no. Firstly, put some pants on, young lady! I only wore the hat when outdoors, but my hair has just been awful lately - thank goodness I got it cut! Today is my day with my niece, Zoe! She just turned 10 yesterday, so we are spending the entire day together. We're going for lunch at the local diner, having a manicure, shopping and going to a rooftop restaurant...and she knows none of this! I'm so excited. 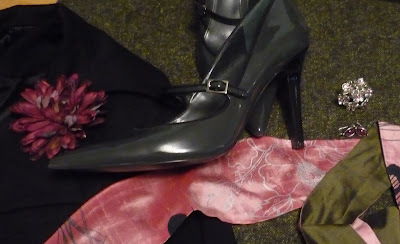 Hat (Delux), shirt (Club Monaco, consignment), vest (Esprit), skirt (Bebe Sport, swap), tights (Trasparenze), boots (Cougar). Today was a crappy day. I'm hormonal, and things just went wrong. I need dinner, wine and a couch, in that order. Audi's pink and green the other day reminded me of this obi, and that led to the jacket (which has been sitting in the closet for months since I bought it in the summer), and the skirt. 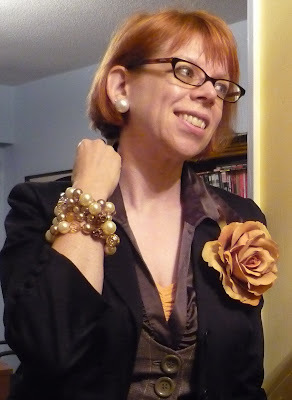 My lapel flower (inspired by Kari's) and my flower ring. The grey shoes go with the barely visible grey cami and the silver in the silk-screening in the obi (which also has flowers on it). I do love a bigass ring. Jacket (La Classe Couture, thrifted), skirt (Precis Petite), obi (Smoking Lily, consignment), shoes (Ralph Lauren, consignment), ring (Guess), earrings (90s, don't remember), flower pin (Roberta's Hats). One of the reasons I love fashion is creating new outfits - that first excitement when you get a new piece of clothing or accessory and then putting together outfits around it. When I thought about what I am wearing today (because as I type, I am still wearing this outfit, having not changed into my jeans and sweater for the evening), I realized that not one thing in it is new; I have worn every piece before, some of them many times. And yet, it still felt new to me. And I felt colourful and kind of funky, but still modern and classic. I think you can be all of those things at once - why not? I love these "tattoo" nylons! They make me feel like a rebel. Ha! I think of this top as "Londyn's Top" because she has the same one. It's the most comfortable top I own - totally loose and light. I last wore the shoes here , just after I got them. They are, of course, the "Something Orange". Nice to show them off with a skirt this time. 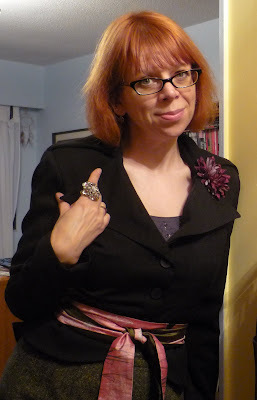 Jacket (RW & Co.), blouse (Nine West), skirt (Armour Jeans, consignment), shoes (Valley Lane, gift from mother-in-law), belt (Plum), bracelet (Plum), earrings (The Bay). 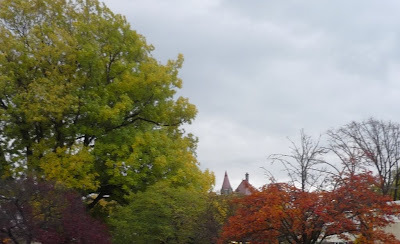 I love this time of year: all the leaves are yellow and orange and red, the air is crisp, and it smells so good. There's something about when I wear pants that makes me want to pose like one of Charlie's Angels. I got this jacket in a thrift store last spring and it's been too warm to wear it until now (it's a thick wool). It almost makes me wish the pants were cropped. L's reaction to them was, "Uh....no. Those are a joke, right? You didn't actually wear those?" Ha! My awesome shoes, and a close-up of the groovy patterns on the knee-highs. 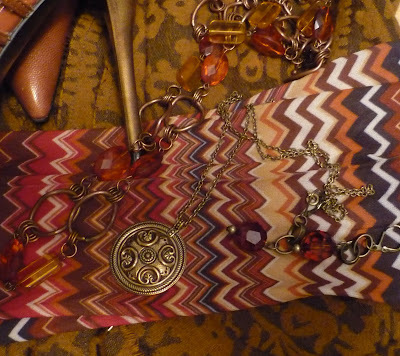 The jewelry: A reproduction Viking pendant, and some mixed amber and bronze-y things. I have pathetic upper body strength, especially since I had to stop going to aikido. I find weights dull, gyms claustrophobic, and I'm lazy as heck. Knowing that the mighty push-up is the "goddess" of upper body workouts, I thought, "There must be a way that I can use this to get stronger arms." So here's what I'm going to do: I drink a lot of water. I mean a LOT, easily over 2 liters a day (about 2/3 of it in the form of herbal teas). So...I pee a lot. My idea is to do 10 push-ups off either my desk at work or the countertop at home...every time I go to the bathroom. Push-ups on the floor...I'm not strong enough. Against the wall - too easy! But doing them off a mid-height surface? Yeah, that's just about right - and I can feel it after 10. And it only takes about 20 seconds to do 10. I can't commit to a half-hour workout, but 20 seconds a pop? Sure! And you know what? I did SIXTY (60) push-ups today! If I can keep this up for a week, or a month or a couple of months, I bet I'll have great upper body strength! I will do them for a week and post a picture of my arms and shoulders next Tuesday. I think it's brilliant. Let's see how long I last. Jacket (Lux, thrifted), top (Planet), pants (Mac & Jac), knee highs (Sox Trot), shoes (Luichiny), pendant (gift from L), necklace and earrings (Plum). Ummm...yeah, that's a lot of black. Woo! That's more like it! Can you see why I fell in love with this? I adore the colours, the fullness (it has a little crinoline with netting underneath it for extra pouf), the high waist. I do think I could have done something more colourful with this (I was going to do purple tights, but they are in the wash), and definitely plan to. I haven't worn this jacket since this wardrobe challenge last December. Yikes! Man, my hair looks awful today. I need a haircut, stat! 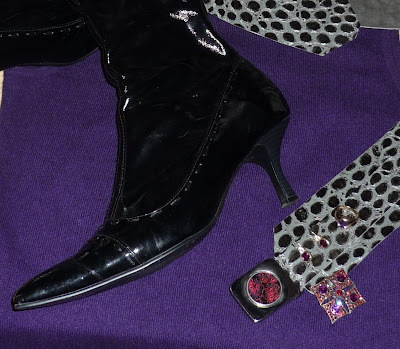 My lazy accessories: stinky boots (buckles! 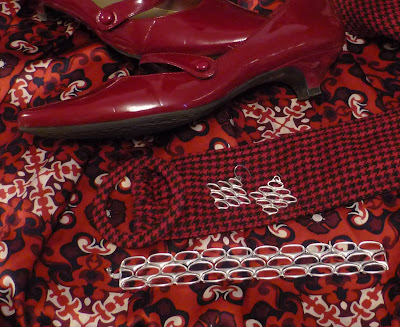 ), wide belt (buckles! 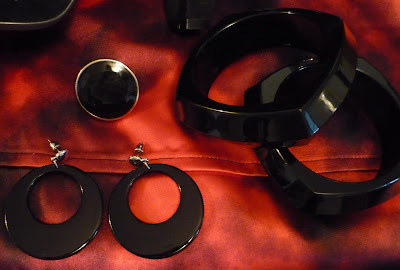 ), black/silver ring and earrings. Jacket (Raindrops), top (Jacob, consignment), skirt (Le Chateau), belt (Jacob), tights (Hue), boots (eh, some cheapie brand), ring (Le Chateau), earrings (The Cobbler). Woo, Wasn't That a Party? "Forty-two, " said Deep Thought, with infinite majesty and calm. But what was the question? We don't know - but what an answer! I know! Isn't it killer? The seaming is amazing, and I love the "red storm" pattern of it. Yeah, baby! We really cut a rug in our fab party clothes! Look at the heels on those babies - they killed my feet, though. Note to self: get some more Dr. Scholl's inserts. 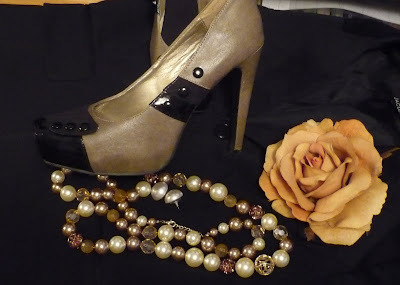 All new black accessories from my fave place for good cheap jewellry, Le Chateau. The two bangles were on sale for $4.99, the earrings were also $4.99, and the ring was $15. We had about 20 people, and the last of them left at 3 am. Oh, I got a Winners gift card from the Winesday Women! More "banned" shopping! Hurray! Dress (London Times), Fishnets (Hue), shoes (Calvin Klein), accessories (Le Chateau). Some casual Fridays, I just don't feel like weaing jeans, plus I planned to go shopping tonight and spend my birthday money, so I needed stuff I could slip on and off easily. I'm sorry it's hard to see but the cashmere sweater is dark purple (the centre light in the den is burned out and I haven't gotten around to replacing it). This is my black tiered flounced skirt. Loaded up with my gloves and a velvet scarf for outdoor walking. The purple is not quite THAT bright - stupid flash. Wearing the Shi Studios belt again. 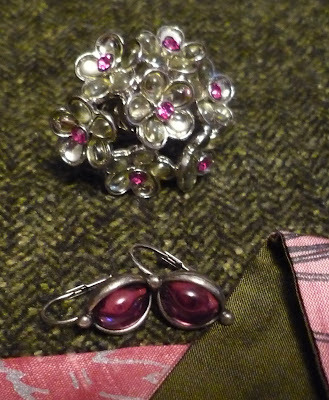 The brooch was on the jean jacket pocket flap. Okay...my confession. I spent $13 tonight in violation of my "no new clothes or shoes" shopping ban (see the sidebar for my self-imposed restrictions and click the title for the reasons behind it). I got $120 from my relatives for my birthday, and after discussion with L on the ins and outs and the rules and whatfors, it was agreed that the money, as a gift, could be spent on "banned" items. Specifically, we're having a party tomorrow night (yay! October birthdays rule! 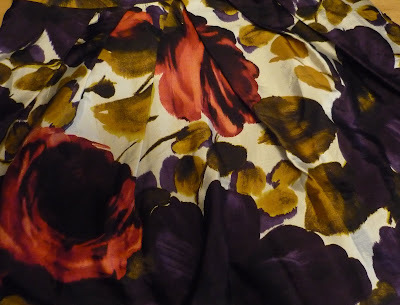 ), and I wanted a new dress. For you see, women do not consign their party dresses. Sundresses: yes. Work dresses: yes. Pretty party dresses: no. Every woman I asked admitted to having dresses in her closet that were 5 to 15 years old, "Just in case I need a fancy dress." So I headed off to the mall in search of a dress. And I found one! It was on 40% off or I wouldn't have been able to afford it - it ended up being $83. Then while shopping for some accessories for it (found), I saw The Skirt. Oh, so pretty...but $50 on sale. Yup, that's $133...I hemmed and hawed for about 20 minutes. I put it back. I grabbed it again. Then I thought, "I won't tell! No one will know." But I'd know. I have not spent a single penny from January 1st to now on brand new clothes or shoes - it's all been swap, consignment, thrift or gifts. And I don't intend to fall off the wagon - I'm going right back to my challenge. And I will do it. So please don't condemn me. I'm human...and when you see this dress and this skirt, I hope you'll understand. Jacket (Ann Taylor Loft), sweater (Daniel Bishop, consignment), skirt (Club Monaco, consignment), boots (Expressions), belt (Shi Studio), assorted jewelry. Ties and Bows and Ruffles, Oh My! She/Shi Week - It's Bird O'Clock! She/Shi Week - Red A-Go-Go!